I almost didn’t post this week. I’ve been super mega busy with editing Veil of the Corrupter and for anyone who hasn’t noticed, it’s friggin Christmas!!! Which means decorating, listening to Mariah’s “All I want for Christmas is you” on repeat and spending ridiculous amounts of money while my husband yells “Rabble Rabble!!! !” and tries to hide his wallet from me. As you all know, Christmas makes me giddy. It also means that Starbucks have some new delicious themed drink. This year I tried the Peppermint Frappucino and I know some people hate Starbucks for ethical and economical reasons, but I just want my Christmas drink ok, leave me alone. I refuse to let you ruin my special holiday. I will be announcing the release date for Veil of the Corrupter at the end of December. It will be available for pre order through amazon on kindle and paperback, as well as smashwords and itunes. Bloggers or reviewers who are interested in an E-ARC of Veil can send me a message. I would LOVE to hear from you! I will giving away autographed copies of The Empyrean Key in paperback, both here and at goodreads.com, also at the end of December. I am working on a new YA Fantasy book that is a loose retelling of Beauty and the Beast. I’m hoping to get the first draft nailed down in the new year. And now for those who just looove my midweek motivators…. Guess what? EDIBLE: Pavlova – A Kiwi classic. It’s all meringue (Fun Fact: I never spell meringue right, I mean, that’s not what it sounds like; meringue, that doesn’t seem right. I bet the inventor spelled it wrong and everyone just went with it), whipped cream and fresh summer fruits like strawberries, grapes, kiwifruit and passionfruit. YUM. When this is on the table I feel like Christmas just exploded on my face! Wait. What? VISUAL: This was tough because Christmas is not traditionally associated with hot dudes. Most guys in Christmas movies are dads who wear festive jumpers and a good pair of slacks. Oh but wait. Die Hard is kind of a Christmas movie. It takes place during Christmas, and who’s in Die Hard? Bruce “Yipee-ki-yay Mother#@!! @*#” Willis that’s who! Rather than a festive jumper he struts about in a bloody wife-beater wielding a Beretta 92F. Awww yeah. AUDIBLE: Mariah Carey is straight up cray-cray but when this song is on the radio you better move aside because Jo is about to RIP.IT.UP. 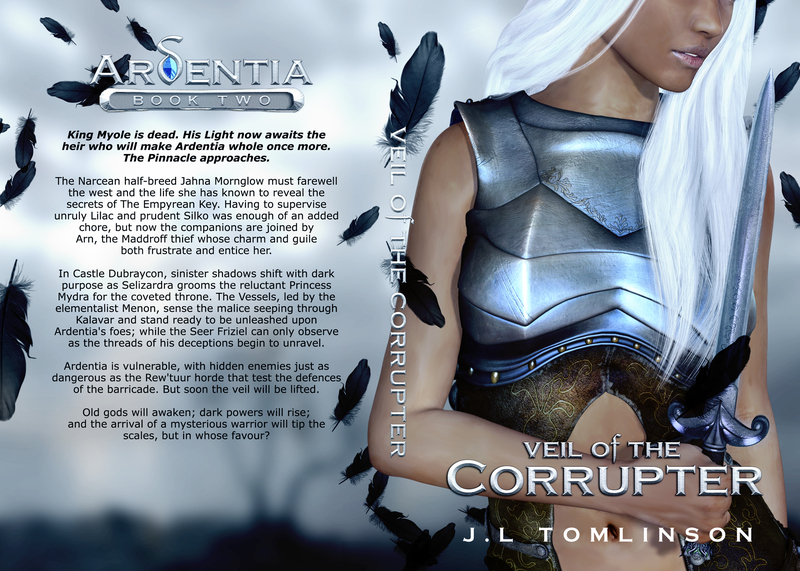 I’m super psyched to share with you the cover design and excerpt for Veil of the Corrupter, the second book in the Ardentia series. I absolutely love this cover. Where The Empyrean Key introduced you to Ardentia, Veil of the Corrupter delves deeper into the legends and mythology of the world and throws our beloved characters in the thick of it. This cover is darker then Empyrean Key simply because the story gets darker. 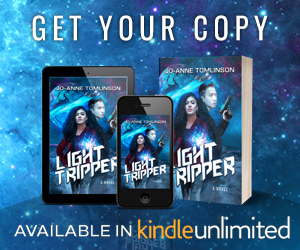 Jahna had a taste of danger in the first book but this time around it will become an unfortunate regularity on her quest for the Key. Sunlight, soft and hazy, shone down upon a small clearing. As they approached, dirt gave way to cracked stone and in the centre of the clearing stood a statue of Fressia, Guardian of the Overgrowth, with snaking vines for hair and skin made green by moss. Jahna had never seen a Celestial idol in such disarray. She was marred with dirt and overrun with the growth of the forest. Some would consider it blasphemy to have her so uncared for, but people clearly feared the forest more than the deity’s wrath. Lilac crouched down to wipe away the dirt that masked the talisman of Fressia, etched into the statues base; a single heart-shaped leaf, encircled by a wreath of flowering vines. Lilac looked up at the statue, paying particular attention to Fressia’s penetrating stone eyes. Jahna pulled Arn’s coat from his back and quickly threw it over the head of Fressia, covering her eyes. Silko, Lilac and Arn looked at each other with similar puzzlement. They put the clearing behind them and Arn jogged to be beside Silko, putting an arm around him. “Jahna is firmer,” Silko replied. “Have you noticed that when she’s mad, her eyes get all big and her nostrils quiver?” Arn asked. “She never looked that way until you came along,” Lilac grumbled. Each step they took sunk into mounds of rotten leaves atop moist dirt. The undergrowth crunched beneath their boots and aside from that awful sporadic cackle, their movements were the only sound in the forest. “What is that?” Lilac grunted, her eyes scanning the trees as the cackle echoed from the north. “It sounds like a bird,” Silko replied. “No bird I’ve ever heard,” Arn breathed. Jahna saw the anxious tremble in each of her companions. It stirred in her too, but she did her best to hide it. She needed them to be brave, even if they had to pretend. Jahna smiled and gripped Silko’s hand, pulling him tightly to her side. Suddenly there was movement amongst the trees. Jahna saw the blur of fleeting shadows from the corner of her eye, but when she turned, there was nothing. Not even a broken twig or rustled leaf. Just the dark of Tresconset; polluted with ill will and sour smells. Jahna gulped, her eyes watching the forest intently. Before Silko could speak, that horrid cackle pierced the air once more. This time though it was closer; much closer. The shadows returned, weaving in and out of the trees and moving faster than Jahna’s eyes could track. The companions stood with backs together. “There’s something out there, Jahna,” Lilac said. Arn reached to his belt and there tucked away beneath his hanging shirt were two silver daggers. He held them out to either side of his body, gripping the pearl handles in his gloved hands. “You’ve been carrying those since Crushell?” Jahna asked. “A Maddroff is nothing without his blades,” Arn breathed. His focus was on the forest and his intense bearing consoled her wavering nerves. Lilac rolled her eyes and pulled her axe from its strapping across her back. The entire haft was wooden and carved with a deep spiral groove. The double headed blade was flawless silver and set with ornate filigree designs. Lilac gripped the handle, taking a moment to admire her beautifully brutal weapon. The companions fell silent, watching and waiting for the shadows of the forest to make themselves known. There was the resounding crack of a nearby branch; then another; and another, but no matter which direction they looked, nothing could be seen. Jahna couldn’t keep track of her heartbeat, its rapid speed matched by the shallow breaths escaping her trembling lips. And then she heard it; a murmur; a dry gasp and finally a hot breath down her neck. A droplet of thick, mucousy muck fell from above, landing on her shoulder and sliding down the leather of her tunic. Jahna had to fight the voice in her head, screaming at her to not look up. She lifted her chin so slowly that it seemed to barely move at all and found herself looking into a pair of bright yellow eyes, protruding from a face that was almost human. The grotesque creature hung from the tree branch above by its birdlike feet and its body was cocooned in large, ochre feathered wings. Its hair was a dark matted mess and its stone-grey skin was smeared with thick filth. It held Jahna tightly in its gaze then opened its mouth of rotten teeth, unleashing the shrill cackle that had been following them through the forest. Jahna had seen enough. She grabbed Silko and began to run just as the creature unfurled its wings and lunged for her with bony arms and razor-sharp talons. “Run!” she yelled to Lilac and Arn. They ran through the forest, throwing aside hanging branches and leaping over fallen trees. Jahna didn’t know she could run so fast. She had never had such a good reason to try. She looked over her shoulder, hoping to not see that horrible thing close behind them. “What’s wrong, Fingers? You scared?” Lilac scoffed. There was a rustle and a crash from the trees above and the creature fell heavily before Arn, landing crouched on its feet and stirring up a cloud of debris and feathers. It rose slowly to stand tall, arching its back and unveiling its wings one at a time. Its body was emaciated, caked in mud and it made short, stuttered movements as a bird would. Suddenly there was another loud crash followed by that awful cackle and when the dirt had settled Arn now found himself faced with two more creatures, just as hideous and contentious. The creatures shrieked as they lunged forward, swiping at him with their claws. Arn deftly dodged each attack, bending and rolling his body before turning his blades and plunging the left into the ochre creatures shoulder, then the right into its gut. He grunted as he pushed the daggers deep into the creature’s flesh, twisting them inside and watching as a putrid black oil seeped from the wounds. It fell to the ground in racking convulsions, the sounds it made far worse than the cackle. Its agony only briefly held the attention of the other two. They began to circle Arn who stood with his blackened daggers at the ready. Lilac nodded and charged in with her axe held high, only to be slapped in the face with a raven wing and thrown several metres across the forest, her body impacting hard against a tree. Jahna hurried to help, taking up a thick branch and swinging it madly at the raven winged creature, but it evaded Jahna’s every strike. The second creature, with wild orange hair, swooped upon Arn, but he was ready for it, slicing his dagger through the soft skin of its belly and opening it up. Rather than falling like its brethren, this one grew more furious with its pain. It took swipes at Arn’s face and slashed at his chest, tearing his shirt and cutting deeply into his skin. Arn flinched but despite the pain he spun around, dropped to his knees and moved to plunge both his daggers into its legs. The creature beat its wings, rising into the air and hovering just out of Arn’s reach. It lashed out with taloned feet, slashing Arn’s forearms and wrists until he could no longer grasp his daggers and they slipped to the ground. Like a tornado of bone and feathers, the creature spun furiously towards Arn. With eyes wide, he tried to clamber to his feet, but the beast was already upon him, landing a crushing blow across his jaw. Arn staggered, and as he began to fall, the creature scooped him up into its arms, running with lightning speed and vanishing into the depths of the forest. She went to give chase but the raven winged creature would not allow her to pass, blocking her every attempt to escape. Lilac stumbled to her feet, taking a moment to focus on her surroundings. She collected her axe and labouringly charged at the creature, smacking it across the face with the haft. The creature took flight, striking at her from the air with those vicious talons, slashing and slicing her face to shreds until she was blinded by her own blood. Silko bit his lip and clenched his fists, finding all the courage he could. Jahna was too slow to grab him before he ran at the creature, only to be buffeted away by its wings and mocked by its cackles. Jahna saw Arn’s daggers lying in the dirt. She took them in her hands, slashing at whatever she could hit and with luck found a thin layer of skin under its wing. The creature screamed as it fell to the ground and Jahna took a steadying breath as she straddled its thrashing body. She raised one of the daggers above its heart and braced herself to end its miserable life. Her breath ceased as she was overcome with searing agony. The ochre creature they’d taken for dead was now hovering above her with its talons buried deep into the flesh of her shoulders. She released a tear filled wail. Jahna had never felt such excruciating pain and it only intensified as she struggled. The daggers fell from her hands and she could feel her skin tearing under her own weight as the creature flew higher. Blood flowed thick from her wounds, trickling down her arms and dripping from her fingertips to the forest floor metres below. The world began to blur, black spots clouded her vision and just when she thought she would pass out, the creature dropped her and she landed with a sickening thud. The creature leaned over her and put its claws to her throat, ready to rip it out. Jahna turned her head, her eyes slowly beginning to close. A roar filled the forest followed by thunderous strides that she swore could be felt through the very earth beneath her. Something was coming. Large and fast, it burst from the gloom of the wood. There was a blinding flash of silver light and she watched weakly as the head of the ochre creature fell from its neck and landed beside her, its yellow eyes still wide open. There was a charge from the raven winged creature, but it was dispatched just as quickly, the silver flash bursting through its chest and shattering its spine. Then silence at last. Horrible silence. Jahna knew as she lay there that she should be scared, but as she dazed in and out of consciousness, she could not find the strength to focus on any one emotion. Soon the figure was beside her and she felt a strong hand lift her head. Add Veil of the Corrupter to your Goodreads and keep an eye out for the early 2015 release date which I’ll be posting in the next couple of weeks. On a side note, The Empyrean Key is now available in paperback for anyone who loves hardcopy. I will be doing a giveaway of a free autographed copy soon, so follow my blog or you might miss out! A lot of work goes into a book, especially when you have a day job! So I would like to thank everyone who supports me and those who have fallen in love with the world and characters I have created.